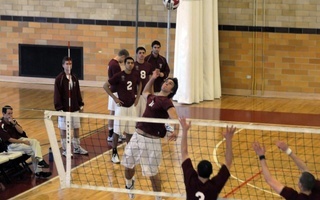 The Harvard men’s volleyball team (1-3) finished out the weekend at home with a split after losing to No. 11 IPFW (5-2) in straight sets Saturday at the MAC. Though the final match score suggested an lopsided day, all three sets went to more than 25 points. Senior outside hitter DJ White spearheaded the Crimson offense with a near double-double, finishing with 16 kills and nine digs. Younger brother and fellow outside hitter Casey White also nearly had a double-double, with 10 kills and eight digs. 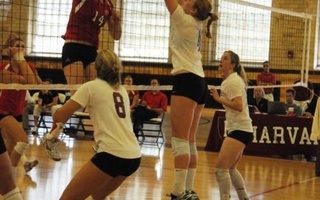 Kostich had 42 assists during the match, and Zimmick recorded eight kills. The latter was also named EIVA Defensive Player of the Week for his efforts, while White was named Offensive Player of the Week in a Crimson sweep. The team had a higher hitting average than the Mastodons—and the previous game—with .340 as well fewer errors, but could not match its opponent in the number of attacking plays, which had 29 more attacks. On the defensive side, Zimmick had five blocks, almost half of the team total of 11. The Crimson held IPFW to a .256 kill percentage, but despite the team’s efforts, the Mastodons had 56 kills and six aces. In the opening set, Harvard fell behind by six points early on, but bounced back to tie the set up at 16 points. The team did get a 25-24 advantage, but IPFW had two kills in a row to put it on top and shift momentum. Casey White responded with a kill for Harvard, tying up the game, but it was not enough to stop the Mastadons, which won 28-26. “Considering we lost by two each game, and in extra points each time, we aren't extremely upset with our play. We fought hard and just couldn't finish,” Zimmick said. The second set was nearly identical to the first, except it found Harvard with the early lead by four points, but the team was set back by errors that allowed IPFW to get back into the game. Similar to the previous set, Harvard came away with a 25-24 lead, but IPFW pushed the game to 26-25 with a pair of kills. Harvard tied the game up, but IPFW came away with the 28-26 win. The Crimson had the lead for most of the third set, with an offense led by DJ White who had six kills in the set. Though Mastodons took the 24-23 lead late in the set, Harvard fought through several match points before ultimately falling 31-29. “It's still early in the season, so we are getting to know each other more each week on the court.” Kostich said. —Staff writer Katherine H. Scott can be reached at katherinescott@college.harvard.edu. Women's Volleyball Tops Conference Rivals in N.Y.
With back-to-back wins this weekend at Cornell (6-12, 2-5 Ivy) and Columbia (8-8, 3-4 Ivy), the Harvard women’s volleyball team (7-11, 4-3 Ivy) jumped into a tie for third in the Ivy League. The Harvard women’s volleyball team battled Yale at New Haven this weekend in an attempt to put a nearly 10-year long losing streak against the Bulldogs to an end. The Crimson, winless against its Eli rivals since 2004, has not even picked up a set since 2010. Both streaks, however, are still alive, as Yale (8-3, 2-0 Ivy) handedly defeated Harvard (6-5, 1-1) in three sets. After advancing to the championship game of the Asics Invitational in Santa Barbara, Calif. by finishing first in its pool Friday, Harvard fell to No. 4 Long Beach State, 3-1.